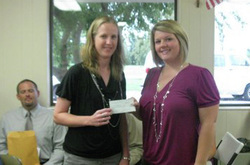 Each year, in the Fall, the staff are asked to apply for Mini-grants that will be awarded in amounts up to $600. 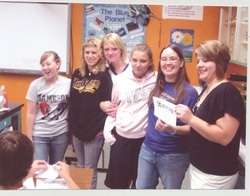 Approximately, $10,000 in Mini-grants are awarded each school year. 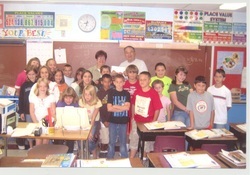 In 2010, the foundation awarded over $11,000 to the High School and Elementary school teachers for various projects. 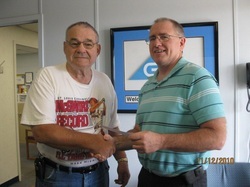 Our area business also provide generous support to the Foundation for distribution to our schools through grants. 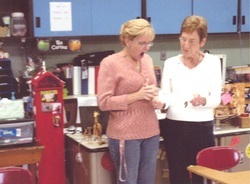 Mrs. Garrels is excited to receive her grant for the 09-10 school year from Board Member Virginia Kloss. 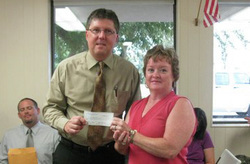 Mrs. Rimar accepts a grant from President Roger Kratochvil. 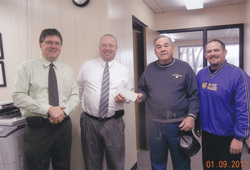 Community support helps to make grants to our school possible. 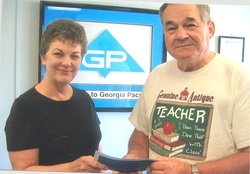 Here Lucy Hughes, representing Georgia Pacific, presents a donation to Roger Kratochvil.